To come up with a "rose" mathematically, you need to use polar equations. In polar equations your variables are q (theta) and r (radius) which can be converted to the x and y cooridanites that we are all used to by x = r cos(q) and y = r sin(q). Well lets get back to the rose issue. The basic n-leaf rose comes in the for r = a + b cos(kq), where a = b. As you can see this "rose" has 2 leafs. Another example is r = 1 + cos(3q), how many leafs do you think this "rose" has? Look at this, there are 3 leafs. It seems like the number for k determines the number of leafs that you will see for this "rose". Instead of having a = b, lets look at all the different case for a and b. There is when a > b and when a < b. For intstance we looked at r = 1 + cos(3q), in this case a and b =1 so change a to 3 and keep b =1 and lets look at the graph. As you can see the inside of the rose is unfolding out. Let's look at a more exterme case, when a and be are much further apart. Let a = 15 and b =1, what is going to happen to the graph now? The graph is getting bigger now expanding out to 15 on both the x and the y axis and it also looks like it's getting closer to a circle. Well there is a few ways you can think of this. One way is just understanding the equation itself. r = 15 + cos(3q), the cos(3q)'s values will only range from -1 to 1 no matter what values you put in for q. The 15 is doninating the equation only being varyed by one and that's why the graph has an egg shaped look. 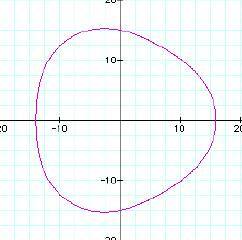 So if you pick a = 100 the graph will look more and more like a circle with radius 100. The other way of looking at it would be more of a calculus concept. We are increasing the a value and keeping the b value the same sort of like looking at a limit as this equation aproachs infinity. Like what was determined in the other way is that the cos(3q)'s values will only range from -1 to 1, so in this limit it is like a constant. a is aproaching infinity so r = infinity. That graph is a huge circle with radius infinity. So the other case is when a < b. Does not look the rose is unfolding like before but forming more pedals, the same amount that the k value is. Let's look at one that k is odd like r = 1 + 2cos(3q). When k is odd it looks like the "extra" pedals are inside the other pedals.